"On the day I started writing this article, a warm fire crackled in the hearth, snow fell outside the window, and a cup of English tea steamed at my elbow. A setting like that — a cozy, human spot with friends and family near by — really puts me in the mood for just one thing: Science Fiction. You heard right. Science Fiction. Of course, I don't mean just any Science Fiction. I don't mean the sort of thing where characters named "Zargon" from places called "Hydra-Gamma III" listen to bald-headed creepozoids in silver BVDs rant about "pure logic." No, the kind of science fiction I'm thinking of is different. Warmer. Richer. More human. On this kind of science fiction adventure, you don't want skin-tight leotards and chrome bikinis. You want big wool sweaters, hiking books, English tweed and pith helmets, with ankle-length skirts and parasols for the ladies. Yes, this is a special brand of science fiction — my favorite kind. Ever since I was a kid, I've always loved the sort of movie where a proper Victorian professor journeys from the smoke-filled adventurer's clubs of London to some impossible lost world in his own gilded or wrought-iron invention. The kind of story that somehow seems to bypass some of the dead-ends of certain other science fiction; seems to allow us to ponder the kind of mysteries science fiction explores so well without asking us to leave our roots in the past behind. I loved it then, and I still love it today." While The Lost World was Sir Arthur Conan Doyle's greatest contribution to the genre of Scientific Romances - placing him shoulder-to-shoulder with greats like Jules Verne and H.G. Wells - it was by no means his only one. A writer of prodigious talent and extensive scope, Conan Doyle's literature covered a broad range of genres. Not only the writer of detective stories, his proudest body of work was his historical novels, he wrote on social justice causes, drafted up apologetics for Spiritualism, and it was for writing propaganda during the Boer War that he received his knighthood. While Professor Challenger served as the vehicle for the greatest of Conan Doyle's Scientific Romances, and several more thereafter, he was not the only intellect to plumb the depths of a more mysterious world than most are wont to consider. 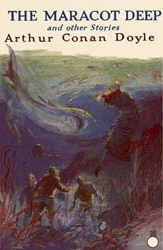 Prehistory was on the brain of Conan Doyle in 1912 when not only The Lost World premiered, but so did the short story The Terror of Blue John Gap. In this, a vactioner finds that rural England is being tormented by nightstalking prehistoric monstrosities living for untold millenia in the boarded-up caverns of the nearby mines. Drifting upwards, Conan Doyle wrote the short story The Horror of the Heights in 1918. Never drifting very far from the "casebook" model of storytelling, one detects a pattern in his Scientific Romances in which a narrator is collecting manuscripts, pieces of evidence, mysterious telegrams, and other evidences to reconstruct some fantastic event beyond the realms of known science and zoology. The Lost World was considerably direct in this regard: the chapters are each correspondences from a reporter who is along for the expedition. The Terror of Blue John Gap is presented as the excerpts of the diary of a Dr. James Hardcastle, published presumably by an executor. The Horror of the Heights is framed as a presentation of a dismissed partial document called the "Joyce-Armstrong Fragment", after its mysteriously missing aeronautical authour. Joyce-Armstrong embarked on a mission to prove to his satisfaction that the atmosphere was populated by its own aetheric ecosystem, and while his plane dramatically returned to the ground, he did not. The Ring of Thoth breaks from the trend with a more traditionally narrated short story about a man's haunting brush with ancient Egypt. Though The Ring of Thoth is not mentioned as an official influence upon Universal Studio's 1932 film The Mummy starring Boris Karloff, it is hard to believe that the script-writers were not somehow aware of this Conan Doyle tale. In it, the long quest of an immortal Egyptian occultist to find the mummified remains of his ancient love has been completed, and with it completion, he divulges his tale for an astonished student of Egyptology. The trend resumes with The Maracot Deep. Written in 1929, it is one of a rash of books written in Conan Doyle's twilight years that, at least in some way, expound on Spiritualism and the authour's lingering message of enlightenment for the world. He wrote The History of Spiritualism and The Land of Mist in 1926, dealing with the subject of Spiritualism directly. The Maracot Deep, published a year before Conan Doyle's death, is subtler in that it has references to past lives and spiritual beings, but they're not quite the point of the thing. The story is about a Dr. Maracot - an oceanographer - and his crew as they descend to touch the bottom of the Atlantic in an experimental bathysphere. Coming upon the gloomy precipice which bears the name of its discoverer, the Maracot Deep, the crew is beset by a monsterous crayfish that snaps their cables and sends them hurtling into the inky depths. However, rather than being crushed like eggs or drowning in the oppressive depths, they find a rather tolerable atmosphere populated by Atlanteans. We saw wars, constant wars, war by land and war by sea. We saw naked and defenceless races trampled down and over-ridden by great chariots or the rush of mailed horsemen. We saw treasures heaped upon the victors, but even as the riches increased the faces upon the screen became more animal and more cruel. Down, down they sank from one generation to another. We were shown signs of lascivious dissipation or moral degeneracy, of the accretion of matter and decline of spirit. Brutal sports at the expense of others had taken the place of the manly exercises of old. There was no longer the quiet and simple family life, nor the cultivation of the mind, but we had a glimpse of a people who were restless and shallow, rushing from one pursuit to another, grasping ever at pleasure, for ever missing it, and yet imagining always that in some more complex and unnatural form it might still be found. There had arisen on the one hand an over-rich class who sought only sensual gratification, and on the other hand an over-poor residue whose whole function in life was to minister to the wants of their masters, however evil those wants might be. There were reformers at work who were trying to turn the nation from its evil ways, and to direct it back into those higher paths which it had forsaken. We saw them, grave and earnest men, reasoning and pleading with the people, but we saw them scorned and jeered at by those whom they were trying to save. Especially we could see that it was the priests of Baal, priests who had gradually allowed forms and show and outward ceremonies to take the place of unselfish spiritual development, who led the opposition to the reformers. At least this much is to be said: Conan Doyle has been one of the few authours to make use of Plato's Atlantis the same way its creator did. In his Timaeus and Critias, Plato invented Atlantis as a foil for his mythic ancient Athens: Atlantis was a cruel, luxurious, morally bankrupt but militarily superior empire that was nevertheless defeated by the militarily inferior but virtuous and patriotic soldiers of Athens. Much literature since the rise of Atlantean fiction and spiritualism in the mid-Victorian era and Ignatius Donnelly's Atlantis: The Antediluvian World has fixated on restoring lost Atlantis or rediscovering its power to benefit our world. As a parable of the decline of a stagnant, affluent society, we see ourselves in the story of Atlantis and write fiction or New Age texts about redeeming, rescuing or reclaiming Atlantis in the hopes of validating ourselves. In The Maracot Deep, to Conan Doyle's credit and in spite of his Spiritualism, he compares Atlantis to our own society in an unrelenting indictment. Like the remainder of the Challenger Adventures, none of these adevntures quite reach the same pinnacle as The Lost World. But really, what else could? That they are not equally as absorbing as one of the finest tomes of the genre is hardly a complaint. They are still perfectly good stories for sitting "round the fire" and enjoying some Doylian Scientific Romance.